Most often she's passing through on business, but lately may have her family with her (husband and currently-4-yo boy). I don't know if she'll have her family in tow next time, but I don't want to get her something that's difficult to enjoy if she does have them. A gift cert to an out-of-the way museum would be great for just her, I think, but if she's got the kid then not so much. I don't think she's big on theatrical productions. She likes just exploring the city, and certainly has seen the most obvious tourist traps already, so something that draws her to a more distant, unique area of the city would be neat. OK, not too distant. If I can't find the right thing, my fallback is to get her a nice poster of NYC, suitable for framing (I won't be able to frame it myself as it will need to travel first). 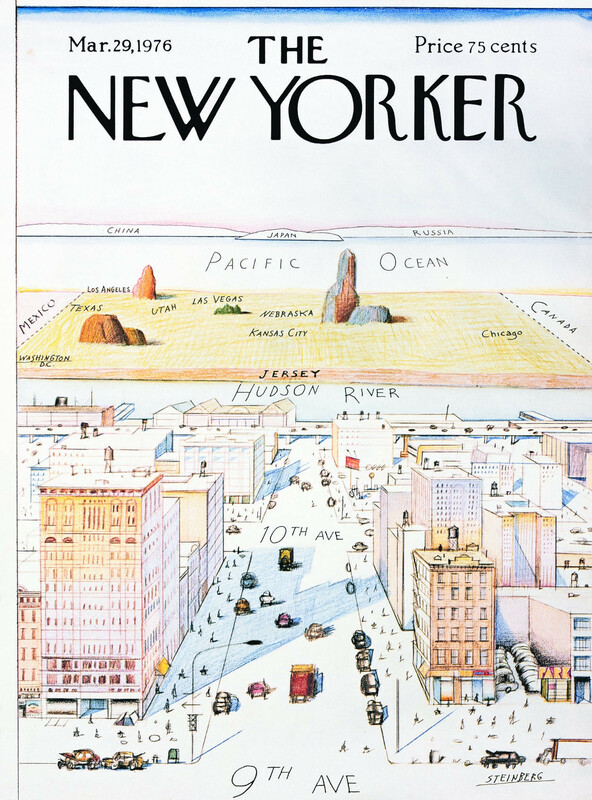 My favorite NYC graphic of all time is this "New Yorker's view of the world" (from 1976, but much parodied / parroted since). I'm thinking of something along that vein, maybe more Euro-centric, like this one found via some googling. 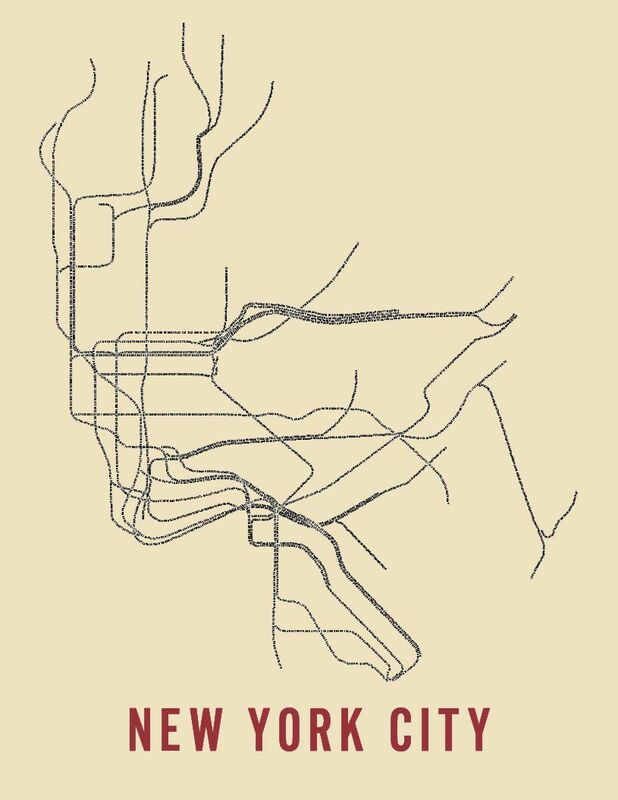 Another idea is a stylized map of the subway system, like this. Any ideas, in either category? Budget is up to $100, much less is OK though. Wow, just came across a great collection of "pictorial" NYC maps here (via one of the links above). The Massimo Vignelli 1972 subway map is a design classic and frames beautifully. I don't see that they have gift certificates but if she visits with her family the New York Transit Museum in Brooklyn is great for kids. Maybe a gift membership if you know she is going with her family? For what it's worth, my experience is that little kids like museums. So I wouldn't necessarily rule that out. Though if you wanted, it might be nice to offer to go along--a higher adult-to-kid ratio could make it easier for her to enjoy the parts she likes at her own pace. One of my favorite NYC map posters is from the Brooklyn Superhero Supply Co.: "Brooklyn and Environs, with Zones and Locales Shown to Serve in the Struggle Against Villains Wherever They May Be Found." Requires (and rewards) a sense of humor. Definitely suitable for framing and in fact a reasonably detailed map despite its silliness. Seconding the Transit Museum. Also, the Museum of Math is a great trip with or without kids. Four years old would be a little young for some of it, but there's still lots for them to press and twist and stomp on, etc. But if you do find that they do, I can definitely recommend a kid-friendly museum in an out-of-the-way area, and one fascinating enough that solo adults would be interested - the New York Hall of Science out in Flushing Park. It's hands-on, educational, and in a historic building - Flushing Park was the former site of two World's Fairs, and the NY Hall of Science is housed in a former exhibit hall from the 1965 fair. Also, right close by you have two or three other historic/museum attractions right there in the park - the Queens Museum of Art is a short walk away from the Hall of Science, and was also in a former Worlds' Fair building, this time from 1934 - and that same building got re-used in 1965. And, it was also the original site of the United Nations. The Museum also has an exhibit on the two Worlds' Fairs, and includes the New York Panorama, a scale architectural model of the entire city. And just outside the Queens Museum of Art is the Unisphere, which you've seen in countless films, as well as the ruins of the New York State Pavillion, which you have also seen in countless films (you can't go inside, unfortunately, but you'll recognize the flying-saucer tower things). That's all in Flushing Meadows Corona Park, which is accessible on the 7 train and the Long Island Railroad, both of which have stops right in the park. Yes, her 4 year old would love the NY Hall of Science (as mine does), so definitely recommend it even if you can't get a gift-certificate there. The Transit Museum in Brooklyn is THE BEST and it is perfect for a family with a young kiddo. I have a print of this Jenni Sparks map of NYC and I am always seeing new details in it. Thanks for the answers so far! With kids, I think the Transit Museum is an excellent idea. Most people would consider it wasteful to go all the way out to Flushing without also hitting up some of the excellent Chinese food on the 7, if that would be an added attraction for the park idea.